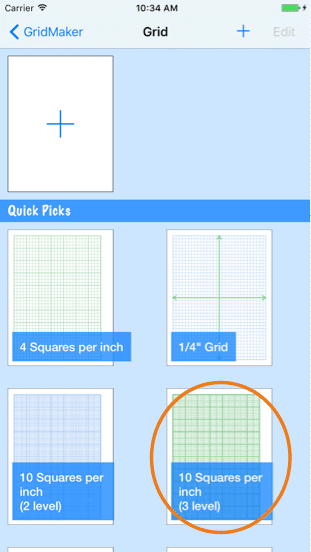 Color emphasis lets you create a grid with finer lines for more precise plotting. GridMaker provides up to three levels of grid subdivision — major, minor, and subdivision. ​Switching to the “Green” palette makes the graph lines a bit darker. The first color of the color row is still being referenced— but now first, darkest shade of green in the Green palette is used instead of the green, first color of the Default palette. NEXT — ​We need to visit the different grid levels - starting at the finest (Subdivision level) first. The finest line width is already selected, so we can leave it. ​Change the sub-division line to the palest green color. To quickly see the graph in red or gray, just go back to the Color Palette and pick a different palette off the wheel. Find another color you like? Save it with the new color, or go to Settings to give it a new name and save it as another, different paper. That's just how easy it is to use color to provide just the right differentiation between the colors used for the lines in your graph.